Let your style sparkle through. We all know for a fact that your shoes can make or break an outfit. So with the most festive and glamorous time of the year just around the corner, make sure to wear the perfect pair of kicks. 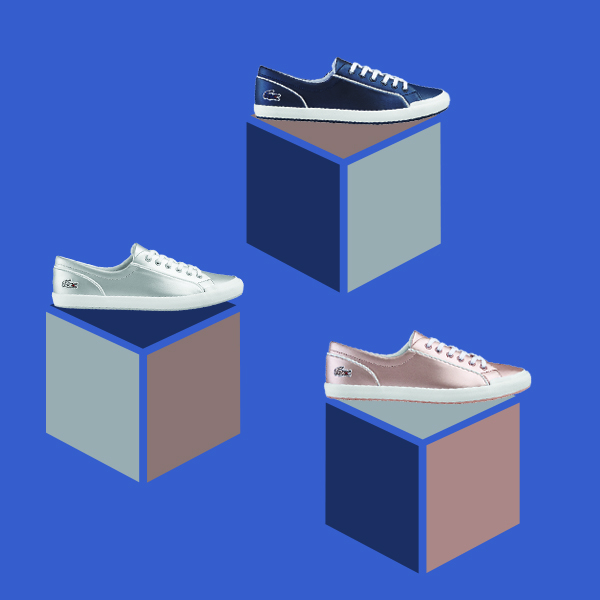 If you’re not a fan of platforms or the likes, Lacoste’s latest collection, the Metallic Pack, allows you to dress up with shine sans the discomfort. Which one would you go for? Look chill but polished on a Christmas brunch out with your girlfriends, match the new Lancelle Slip Ons with culottes or an ankle-length plaid skirt. The shoe has an elastic piece of rubber inserted in the sole for utmost comfort. It comes in light pink, gray, and navy blue. Let your shoes balance out the colors of your entire look. If you’re going with neutral tones, add a striking hue to your #KOTD. Match the Lancelle 6 Eye made with synthetic leather and a matte metallic finish with your favorite black pants or an A-line skirt. Opt to pair it with an ivory long-sleeved turtle-neck and top it off with a bomber jacket for some layering. Who says you can’t look chic and sporty during the holidays? Flaunt your toned legs and new Carnaby EVO (which comes in light pink, light gray, and navy) with a dark buttondown dress. The rubber sole especially complements the sporty look.